When it comes to organising firework displays, there are many things to consider, from your venue, the budget, responsible places to source the fireworks from, and also how best to structure your firework displays to ensure maximum enjoyment from your audience. Like every good story, a firework display needs a beginning, a middle, and and end – or in this case – a fabulous finale with a bang! Of course our blogs are only suggestions from our tried and tested methods when organising firework displays, so if you have your own preferred structure, then please go ahead! Remember, most people will not know how the display was meant to be structured, so do not panic if you light them in slightly the wrong order. Having said that, make sure you keep your finale till the end. But more about that later! The opening of firework displays generally goes one of two ways. Either open the show with a bang to grab the attention of the spectators, or start with something smaller and build up the show from there. If you prefer the former, then a couple of great rockets are the way to go. They shoot high, they are loud, and certainly pack a punch. 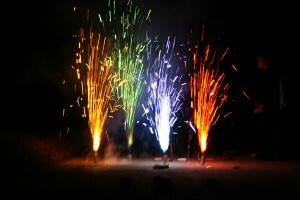 Take a look at the rockets for firework displays available at Fireworks Den here. For those of you wanting to start with something a little quieter, we would suggest using some ground fireworks such as mines, cones and fountains. 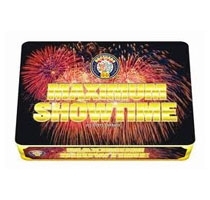 You can check out our selection for your firework displays here. If you simply cant decide between a rocket start vs. a gentle opening, then perhaps mix some fountains with some roman candles or smaller barrages so there are some shots which go sky high. You might want to give out sparklers to the spectators to increase their involvement in the display. Everyone loves a sparkler! Here is where your firework displays get interesting. You need to introduce many colours, effects and sounds into the mix. You need to pick up the pace, leave no gaps between fireworks – perhaps even light more than one at a time. Remember fireworks need to be spaced a safe distance from each other, so you may need someone to help you if you want to light more than one firework at a time. It is at this part of firework displays that we would suggest introducing some small barrages, followed by some of the larger ones. Just be aware that some barrages so have rather spectacular endings, so don’t pick something that will overshadow your overall finale for the entire firework display. You can check out the small barrages and large barrages complete with videos on the Fireworks Den website. You might want to continue using some ground fireworks throughout the middle part of your firework displays rather than have everything with high flying shots. This is the part of the display that people will remember, so give them some great memories! It arguably the most popular part of the entire display even though it might only consist of one or two fireworks. Enter the single ignitions. Many of the larger ones have incredible finales sure to give that wow factor. Some of these have a very large spread, so make sure you have enough space to light these safely. Our favourite is Maximum Showtime. Check out the details and video here. Simply amazing. So that is the story. Remember, grab the attention of the audience, avoid gaps in your firework displays, and end with a bang to remember! This entry was posted in Firework Displays on March 29, 2013 by Becky.